Records from the United States Center for Disease Control and Prevention show that the nation had 63,298 twin births in 1971. In 2014, that number more than doubled to 135,336. 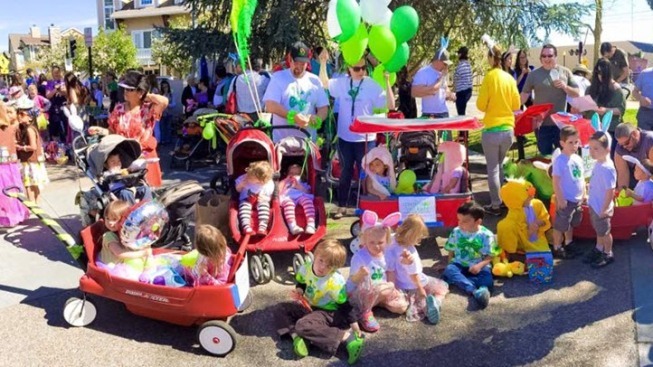 Families of twins and multiples marched along Campbell Ave. in Downtown Campbell for the annual Easter parade. SAN JOSE, Calif. - The pitter-patter of tiny feet echoes off the mats as toddlers shuffle from one piece of play equipment to another during a playdate. Others are still too young to be able to walk, so they crawl to their parents' open arms. First, one infant, then another. The gathering doesn't appear to be any different than a group of loving parents doting on their adorable babies. This is no ordinary gathering, though. These parents all have twins or multiples, and they're members of a non-profit organization in the Silicon Valley called Gemini Crickets, which arranged the playdate. The event is a chance for families to get out of the house, make new friends, and share the joys and struggles of parenting twins or multiples. Founded in 1971, the group launched with just 20-something members. Today it has grown to 235 people and serves families in Santa Clara County by providing playgroups, educational programs, and social gatherings. The organization gives them opportunities to learn how to survive parenting twins and multiples, especially during the first year, which is widely considered to be the most challenging for any new parent. Much has changed in the last 45 years. Records from the United States Center for Disease Control and Prevention show that the nation had 63,298 twin births in 1971. In 2014, that number more than doubled to 135,336. Triplet births climbed from 1,034 in 1971 to 4,233 in 2014. As more women waited until they were older to have children and fertility treatments increased, twin and multiple births jumped to an all-time high in the U.S., helping to create the need for organizations like Gemini Crickets, which is one of six in the Bay Area alone. "Gemini Crickets is a group for people who are going through or have gone through a unique life experience," said Catherine Harwood, membership coordinator and mother of twin boys who turn four years old in May. "The online forums have been really useful to me because of the tips and advice on how to survive life with twins." The forums are online discussions for anyone who might have questions about how to deal with nursing, feeding, or sleep issues. While membership is required for families to take advantage of the benefits, its semi-annual garage sale is open to the public. Thirty families are set to sell used baby and children's clothes, toys, and equipment Saturday, April 23 from 8 a.m. to noon at Lincoln Glen Church in San Jose. Gemini Crickets will also have a booth set up for donations to support its philanthropic programs. “What many people don’t know is that Gemini Crickets also provides assistance to disadvantaged families of multiples,” said Karla Holmes, the group’s philanthropy coordinator, who has 2-year-old twin girls and and a 9-month-old boy. When families suddenly face double or triple the costs of raising a child due to the birth of multiples, Gemini Crickets can be a crucial resource. The organization not only helps provide baby supplies, clothing, and toys to families in need, but it also helps with meals during a time when parents are too busy feeding their babies to feed themselves. If transportation is a problem for families trying to go to their well-child visits, Gemini Crickets can assist with the costs associated with those important appointments. Throughout the year, the group also holds several discussions and classes, featuring special speakers who address everything from potty training to positive parenting techniques. "We've contacted local hospitals, churches, and the media to let them know who we are and what we do," said Amy Fonseca-Nave, president of Gemini Crickets, who is also mom to 2-year-old boy/girl twins. In order to qualify for philanthropic help, families must be referred by local social workers. They must reside in Santa Clara County and have twins or multiples under the age of five. Gemini Crickets also verifies that they are currently receiving assistance through a state or federal program. "It's our mission to help those in need, and we've already helped five families so far this year by providing basic gear and supplies to get them on their feet. If more people knew about us, we would do more," Holmes said. Gemini Crickets is planning to celebrate 45 years of service with a special gala next month. It’s invited more than 1,000 former members.